Interact with local or internet knowledge bases. 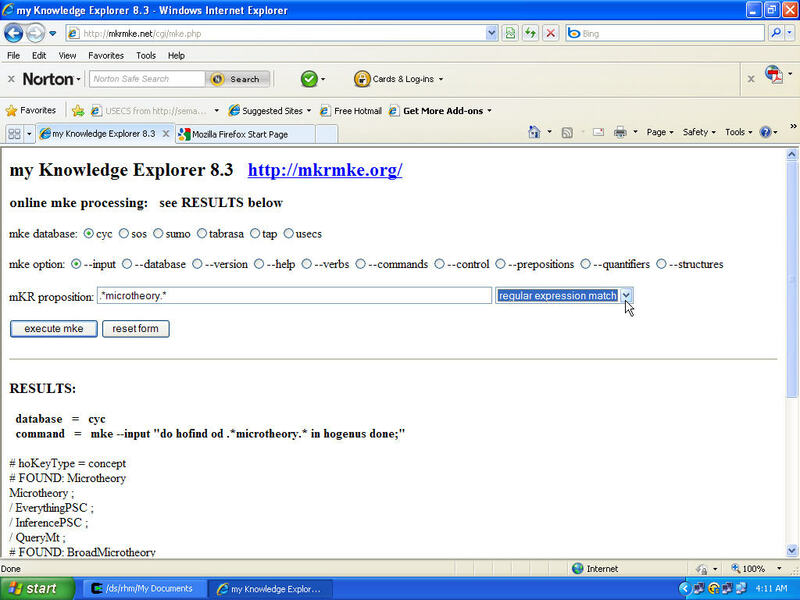 My Knowledge Explorer uses the mKR (my Knowledge Representation) language to create, query and update mKB (my Knowledge Base). mKR is a useful mixture of English (subject, verb, object, preposition phrase) and the KornShell (variables, procedures, control structures). mKB can be a local user KB or an internet KB such as OpenCyc. The Redland RDF Library commands can be used to translate mKR to/from standard W3C languages such as Turtle and SPARQL. The author (in good faith) refers to GPLv2 as "GNU Open Source" in filenames. The author does not have a public VCS to create a direct link to the license. This entry (in part or in whole) was last reviewed on 12 June 2015. "Lead developer" is not in the list (Maintainer, Contributor, Developer, Sponsor, Unknown) of allowed values for the "Role" property.